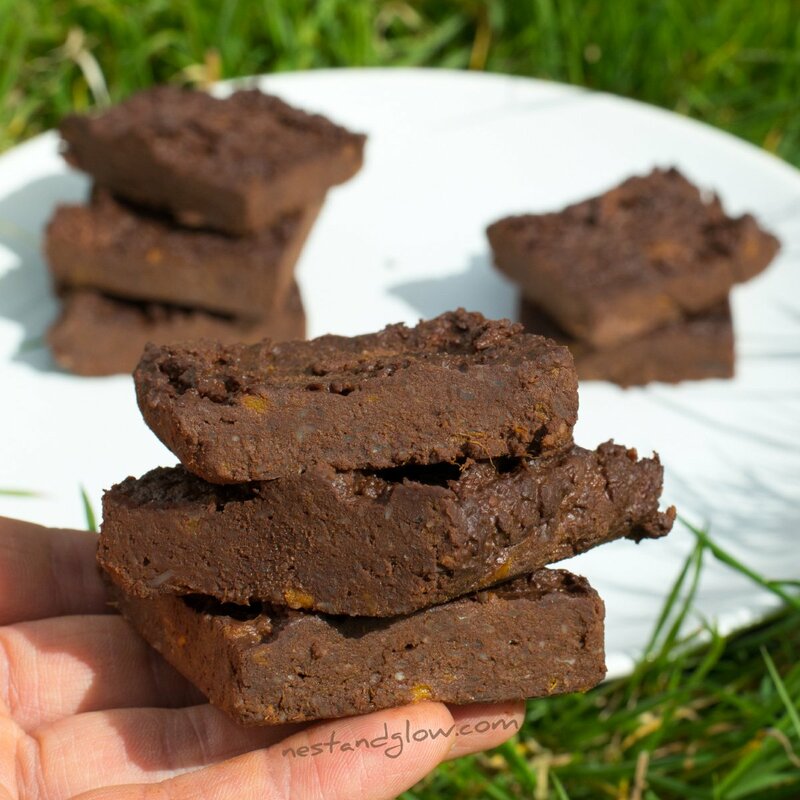 Healthy sweet potato chocolate brownie recipe that’s easy, foolproof, full of fibre and loaded with nutrition. 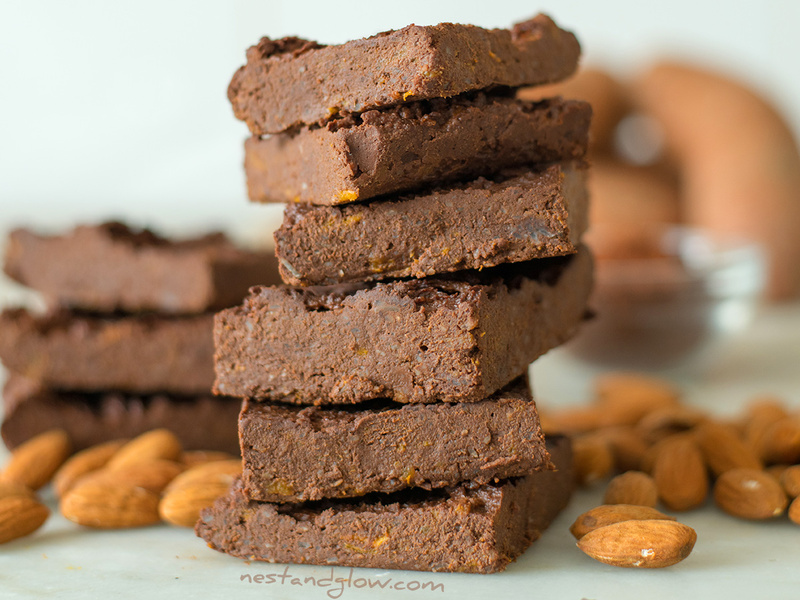 It’s moist and fudgy with a rich deep dark chocolate flavour but not too bitter with sweet almonds and sweet potato. There’s more nutrition in a slice of these healthy chocolate brownies than many people have in a day! 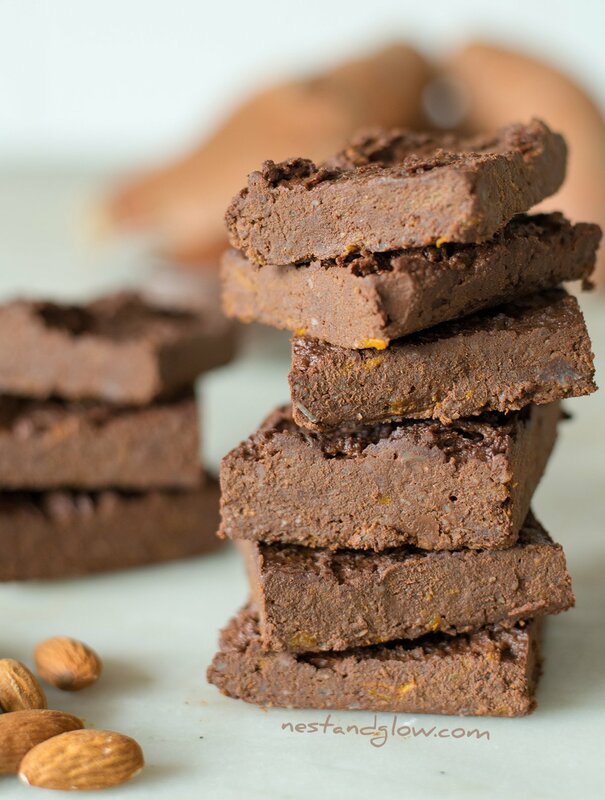 This brownie recipe is suitable for vegan, plant-based, paleo, gluten-free and general healthy whole food diets. To make totally sugar free and keto chocolate brownies make with a chocolate that is sweetened with a keto sweetener such as xylitol. 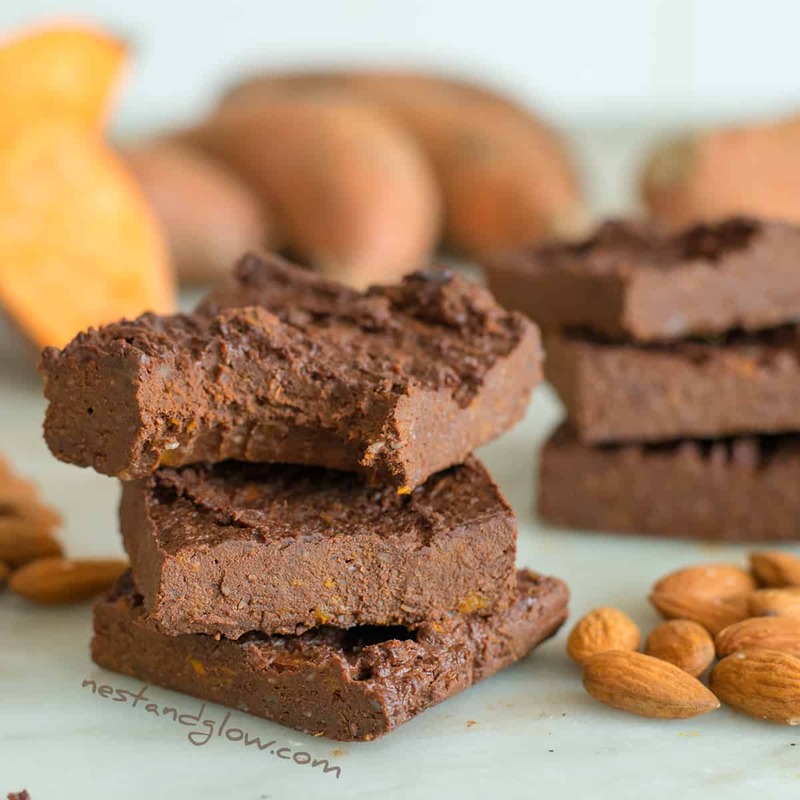 My healthy chocolate brownie contains no flour or butter but instead, ground almonds and sweet potato are used to give a brownie with great texture. This also means it’s high in protein and low in saturated fat. I was planning on calling these no-bake chocolate brownies but I really wanted to bake the sweet potato rather than steam as it’s way easier and more flavourful. With baking, just prick it, bake and then scoop out the insides. Baking makes the sweet potato cook in its own juices and is not too wet like boiling or steaming will. There no need to heat your bowl while making these sweet potato chocoalte brownies as the residual heat from the sweet potato is enough to melt. If you are left with any lumps its actually a good thing as they are lumps of chocolate! As this is a healthy chocolate brownie recipe I’m using an 84% dark chocolate bar that is low in sugar. You can get sugar-free chocolate bars sweetened with xylitol to make it totally sugar-free, I’m fine with a small amount of sugar that will be mixed with lots of fibre and heart-healthy fats so will be absorbed slowly. As this is a vegan site I use dark chocolate that’s free of butter oil and palm oil as these are creeping into dark chocolate as cheap replacements for cacao butter. Do always choose a high-quality chocolate to make these brownies to avoid inferior grade cocoa beans and cheap padders. Use your favourite chocolate you like to make these brownie recipes. Some that are less keen on dark chocolate have made it with a sweeter chocolate that has more sugar and rice to be a vegan alternative to milk chocolate. You could just add 1/3 cacao powder, sweetener (like maple or date) and fat (cacao or coconut butter) into the brownie batter instead of block chocolate. That would obviously make it not a 3 ingredient brownie recipe anymore but it would be less processed. A high-quality dark chocolate often contains natural vanilla so no need to add any to this gluten free brownie recipe, unless you want extra! Another great thing about this vegan recipe is that you can eat it before setting to check the flavour and adust. 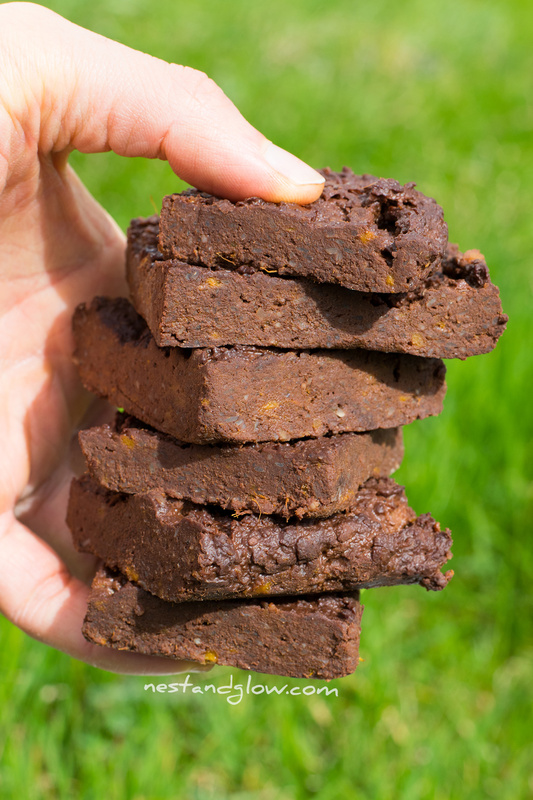 Think of this healthy brownie recipe as a base to add any extras you like such as dried cherries or chilli pepper. I’m using ground almonds in this recipe to make it easy with accessible ingredients. If you want to make this nut free then you can either; grind some sunflower seeds, use buckwheat flour or blend desiccated coconut for a few minutes to make finer. Blend your seeds in a small spice / coffee grinder or bullet device. I use the orange-fleshed sweet potato for this. Some people in the US do call these yams as they were called this to distinguish between the white flesh varieties when first introduced from the Caribbean. But orange-fleshed sweet potatoes are not a yam and these days have to be labelled as sweet potato in the US. A real yam is a tough and fibrous root that only looks similar from the outer flesh. Top and tail the sweet potatoes, prick and bake at 430F / 220C for 40 minutes. Once cool enough to handle scoop out the hot flesh and mix with the chocolate and almonds. Press sweet potato brownie mixture into a square dish about 8″ then chill for an hour to set. 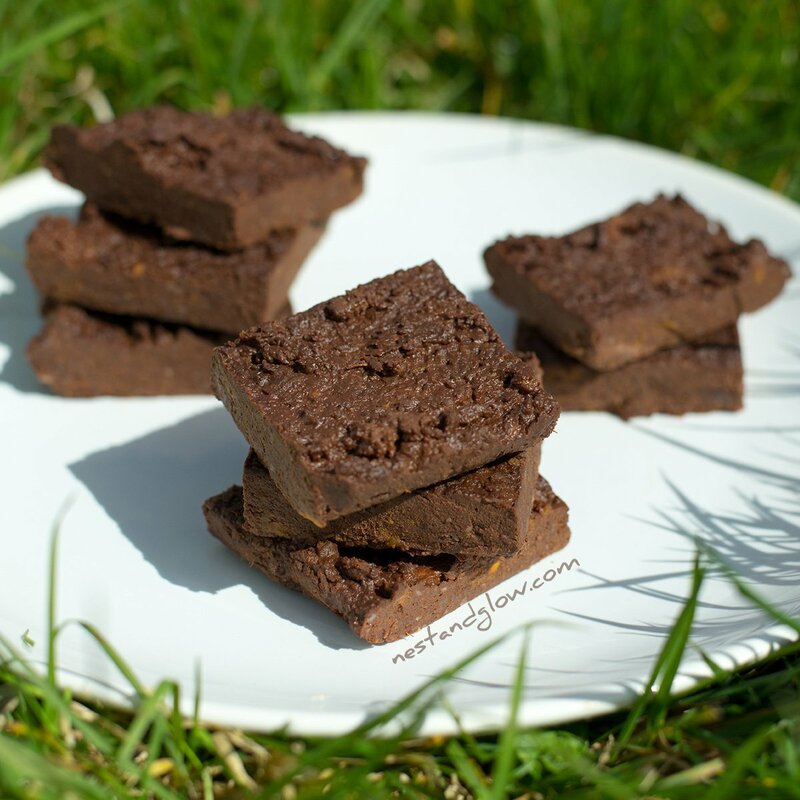 Cut into squares and enjoy the healthy chocolate brownie. Store in the fridge where it will last for 5 days. Don’t throw away the skin – the best thing with baking is you get a chefs treat of the nutrient-dense skins! You can bake the skins for a few minutes to make really crispy. Just made these and WOW! They are absolutely delicious. I wasn’t sure how it would turn out but they smooth and fudgy. Use the best chocolate you can find. I might add walnuts and cranberries the next time. ???? 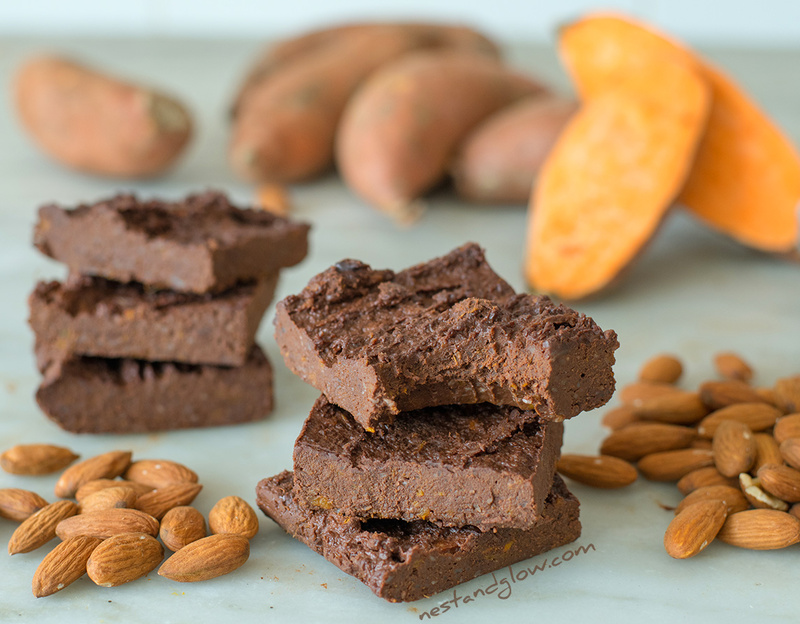 I pulsed 85% chocolate & slivered almonds& baked sweet potatoes like directed, perfect! then added cocoa powder & organic blue agave syrup, turns out more like dark chocolate fudge, awesome! Hi, these brownies look delicious! I am just about to make them. Can I use Cocoa powder instead of dark chocolate? Mine didn’t get firm.its still soft have in fridge for almost 3 hours. What did i do wrong? Hello, maybe try adding some more chocolate? As my recipes are all high in natural produce they can vary alot. Although if it doesn’t set it will still taste great! Thanks i will try it again with chocolate bar. ☹️ I assumed healthy brownies meant no added sugar and to use unsweetened chocolate. Not tasty at all. Bitter; however, that is probably because I used no sweetener. I’m guessing date syrup as the sweetener and cocoa powder would work also but as stated I guess it would firm up like a fudge but I guess some melted coconut oil would replace cocoa butter and if chilled it would firm up. Great idea for Christmas brownies especially if nuts and dried cherries were added. Thank you for sharing. Hey, I can’t find ground almonds can i use almond flour? Yep that works well instead. Let me know how it turns out! Looks great- I need to go gluten free and nut free 🙁 hmm. Wonder what I can use? I can’t use oatmeal or nuts even coconut I can’t use. But looks delish! Thanks for the flash thru of the book too- gotta check that out! How about using ground seeds like sesame or sunflower? Glad you like it! Hi, I made these yesterday and they came out absolutely delicious. Thank you! I also very much appreciate that you also give measurements in grams – helps me to get the quantity exactly right. Thanks again! how firm do these get? would prefer a bit firmer so my picky toddler will eat (instead of see them fallng apart and thinking its time to play instead of eat, ha!). Also, would this work with any other nut grounded, say Cashew or pecan? I made these exactly as the recipe said. I would give them an 8/10. I actually froze them and preferred them right out of the freezer. Also thought I might use a food processor next time to make them more creamy in texture. What do you think? Hi! I made the brownies using your idea of cocoa instead of the chocolate adding dates and a little molasses as a sweetener. I also added some coconut oil. The texture was fudgy and a little softer than what a brownie should be, so I rolled it up into balls, then rolling them in cocoa which I now call healthy chocolate TRUFFLES ????. Thank you for this recipe! It’s delicious and guilt-free! ???? ???? Thanks great to hear and thanks for sharing your adaptation! I made these last night absolutely delicious. I’m not allowed to have sugar and I’m allergic to sweeteners so this is the perfect recipe for me. I’m not sure if that would work as it needs to be cooked. You might want to cook some in a pan with water until it gets dryish then use it? Let me know how it goes! I tried various ingredients (almond, hazelnut, cashew, raspberries, macadamia) and I use 95% chocolate. I nearly don’t eat added sugar, so it’s fine for me. But the sweetnes depends on the sweet potatoes. I guess there are different kinds because the brownies are sometimes very sweet, sometimes just light sweet. Amazing tips and great to hear you liked this recipe Kathrin! Just tried it and added chia seeds to it. Delicious!! For the sweet potatoes, do you mean 11 oz each or 11 oz total? Hello! I have seen a recipe for brownies with chickpeas. Do you think I could replace the almonds with chickpeas? And how should the chickpeas be treated (boiled and mashed? Dried and chopped in a food prosessor? Etc. )? If I use cocoa powder, how much coconut oil should I add? Thanks!